Here’s a comprehensive list of proof elements you can use to ratchet up the persuasive power of your marketing. Orthodox marketing wisdom tells you to “sell benefits” in order to convert more visitors into customers or clients. This is sound advice, but it’s not enough. You also have to prove what you say is true. Testimonials may be the first “proof element” that comes to mind. While testimonials can be very effective persuasion tool, they’re just the tip of the proof iceberg. Below is a monster checklist of 42 distinct proof elements you can use to make your marketing messages more convincing – ultimately helping you to convert more visitors, shrink your sales cycle and boost pricing power and margins. The list is organised in rough order of “Left Brain” (Logical) techniques through to “Right Brain” (Emotional) techniques. Data is useful for backing your claims (especially if your audience are engineers, IT professionals or other left-brain types). However, charts and graphs are often better at conveying ideas than numbers alone. Attention should be paid to the most appropriate type of graph (e.g. pie, bar, histogram, scattergram etc. ), as well as the chart title, axes, captions and other elements to best support your “angle”. Direct marketers have known for many years that specific details tend to drive higher response in advertising. Do you have “Over 2,000 customers”, or “Over 2,357+ customers”? Is the total cost of ownership of your product “more than 30% cheaper” than the leading brand, or “31.2% cheaper”? Making approximate claims sounds a little you made it up, but citing specific numbers sounds like you actually counted. Notice that the two headlines that mentioned specifics – headlines 2 and 3 – were also the top performers. (Headline 3 could have been more specific still, as 55,000 is still an approximation). The Contrast Principle is explained in Robert Cialdini’s Influence: Science and Practice. [The Contrast] principle accounted for, among other things, the tendency of a man to spend more money on a sweater following his purchase of a suit than before: After being exposed to the price of the larger item, he sees the price of the less expensive item as appearing smaller by comparison. Humans don’t understand concepts in a vacuum. We’re much better at understanding qualitative and quantitative differences when presented in contrast to something else. Harry’s shaving products use this simple graph to explain the cost-effectiveness of their product. This is much more effective than simply saying, “We’re great value!” or “Only $2 per blade!”. $2 might sound expensive, until you realise the other guy costs $4. But just in case you haven’t personally conducted any scientific studies lately, you can also employ studies conducted by others to prove and enhance your value. Demonstrating the mechanism that explains how your product works, or gives a sense of how you are able to deliver a superior result, can be very effective. In addition to the “demonstration aspect”, a truly unique mechanism also allows you to differentiate from the competition. “Reasons Why” are an age-old copywriting technique that engages the prospect’s logical brain and boosts conversion in the process. Studies have proven the power of Reasons Why in eliciting compliance to requests. Members of the medical and legal professions have been specialising for many years. It goes without saying that a neurosurgeon will do a better job on that brain operation than a general practitioner. Specialisation carries an implied promise that they’ll do a good job of your next hangar construction project and/or underground lair. Certifications provide extra confidence that you are qualified, approved or licensed to do what you do. In certain fields such as medical or technical areas, displaying your certifications may be seen as a price of entry. That means displaying your certifications won’t necessarily give you a big boost. But not displaying them may hurt your case. Easy-to-find contact information adds a “we’re a real business” factor that gives customers peace-of-mind – especially when dealing with a new vendor. This partial screenshot from the contact us page of media agency jfmedia displays not only the usual corporate contact details, but also mobile (cellphone) numbers and direct email addresses for individual team members. This certainly fortifies the sense that they are transparent and approachable. Omitting critical contact details such as a phone number or address can quickly raise the trust alarms of potential clients, like the website for a B2B firm that I recently reviewed that claims to have a large, experienced team, and yet has no phone number on their website. That’s incongruent. Infographics and other visualisation techniques demonstrate content depth and a sense of polish that enhances trust and believability. The Conversation Prism from Brian Solis and JESS3 conveys a great deal of information in a condensed fashion, and it also suggests that the creators have a wealth of deep knowledge and value to share. “Before and After” case histories are a stalwart of the diet and weight loss industry, where they use the principles of contrast and future pacing to tangible-ise a potential future result. “Before and afters” are not limited to traditional industries such as weight loss, skin care and so on. Case Studies are one of the most impactful proof elements for two reasons. Firstly, because they provide concrete details of how a customer or client has achieved results with the aid of your products or services. Secondly, Case Studies are one of the most eagerly-consumed content types and are very effective in many industries (especially lead generation for complex services and major products). Prospects love to hear how others like them have achieved success, and case studies are the perfect vehicle to do this. Testimonials – first person accounts of customer experiences – are so valuable as proof elements that I always recommend to our clients that they collect at least a dozen solid testimonials as soon as possible. In this test we discovered that adding a dozen testimonials to an online sales letter produced 2.66 times as many sales as a version without testimonials. That being said, there is a right way and a wrong way to do testimonials. The most compelling testimonials focus on proving your point-of-difference benefits. In other words, they will support your strongest differentiating benefits, not just say nice things about you. Testimonial quality is critical, but testimonial quantity can be just as impressive. If you have only 4 testimonials, the prospect might start to think you only have 4 customers. But if you have 400 or 4,000, they will start to say to themselves, “surely this many people can’t be wrong”. Product demonstrations can often convey much more than pages of sales copy ever could. Take a look at the first minute or so of this demonstration video for NeverWet, an anti-wetting coating. Are you in any doubt the product works? Client lists and client logos have become a standard feature in startup and SaaS company websites. Telling your prospects about the company you hang with can be an effective way to garner trust – especially when your prospect is only prepared to act once others are on board (and that’s most people). Social Media Proof is telling prospects, “look how popular and cool we are on social media”. Side Note: Social media widgets may a great addition to your blog, but there is evidence to suggest they may hurt your conversion rate on money pages. There are elements of social proof in many of the other proof elements on this page. Here’s an image promoting the searchlove conference on the website of search consulting firm Distilled. The wide angles lens and large number of enthralled delegates back up the claim that this truly is an “industry-leading” conference. Product reviews can be leveraged in several ways. The downside of running your own review system is that you typically need very high customer volumes and/or levels of engagement to generate a critical mass of reviews. Zero or very few reviews ends up creating negative social proof. Re-printing entire articles, or re-posting videos from third party media outlets is another effective technique, as in this video on the Trilogy Funding website. Publishing valuable content plays a role in traffic generation, conversion and engagement with potential customers. In that sense, it’s the “killer app” of online marketing. But as a proof element in particular, valuable content says to your audience “this person clearly knows what they’re talking about”, and you become more believable in the process. Great content is also an invaluable proof element for startups, because you don’t need any customers (and therefore no testimonials) to create quality content. Ideally, users will apply your great content to create “results in advance” leaving them even more hungry for more. 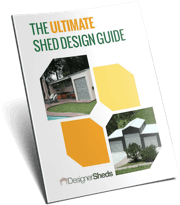 Here’s an example where custom shed manufacturer Designer Sheds gives away a Shed Design Guide to prospects, educating them on what they need to know before building their own shed. High-quality, relevant imagery sends a subliminal signal to the brain that you offer a quality product or service. (Crappy stock images create the opposite impression). Good-quality product photos help to crystallise value and enable the buyer to see in advance what they’re going to receive when they buy. The subtle “action effects” in this photo from Hammacher also help to convey the fun you’ll have playing with this Star Wars Battling Fighters Set. This post on the KISSmetrics blog shares other ideas for boosting conversion rates using images. Association to credibility is a “hybrid” technique and a mental shortcut that our brains use to process information and reach a conclusion. Now seldom seen, the “As Seen On TV” logo plays on Association to Credibility. In its heyday, consumers would think, “if they can afford to advertise on TV, they must be a big, credible brand”. Now this device is reserved almost exclusively for cheezy infomercial products. easyfeet, anyone? You can use a recognised authority to help prove your case in at least two ways. The first is when the authority directly endorses you (see “Celebrity Endorsement” below). The second is when an authority figure says something that simply aligns with your marketing. This is a quote that could be cited in support of the argument for website conversion rate optimisation services. If you’ve won awards, why not tell the world about them? Companies frequently display business awards such as BRW Fast 100 (in Australia) or Inc. awards (in the US) to prove they are successful, credible and rapidly growing. You may have won an award specific to your industry category or product. That can also be used to differentiate you from competitors. Here’s an example by web hosting provider PEER 1. It’s common for companies to hide behind their website or their logo, with very little “human face”. Putting a face to a name is one of the best ways to increase the sense of humanity and transparency that you convey to prospects. This team photo from IT services firm Emerging IT (combined with a very strong guarantee) portrays a professional and dedicated team who are prepared to stand behind their services. Like quoting an authority, celebrity endorsements are technique that transfers credibility, likeability or respect from the celebrity, to your product or service. Sure, there are mega big-name endorsements that cost millions of dollars in sponsorship money to pull off, like Roger Federer or Leonardo Di Caprio for Rolex Watches. At the more modest end of the scale, you may be able to call on a celebrity who is credible to your audience, but who may not necessarily be a household name to the general public. Below is a very specific guarantee from print solution provider Triform. This is far more compelling than just, “we offer great service…really!”. The Sinatra Test is a term coined by Chip and Dan Heath in Made To Stick. The Sinatra Test embodies this phrase. It implies that if you have one BIG example, your prospect will assume you can take care of their needs without question. Mega-proof like this has the effect of short-circuiting deep analysis and allowing buyers to move to action. The same principle is at work in severe “stress test” demonstrations. For example, in Blendtec’s well-known “Will It Blend?” series of videos. Reverse Proof is when you say, “forget me proving myself to you… you’ll need to prove you’re a good fit for me”. Oren Klaff explores this concept in detail in Pitch Anything, where he calls this “prizing”. The requirement to join the priority notification list backs up the benefit of personal interaction and emphasises the scarcity factor. Reverse proof is a technique where authenticity and believability is key. Your prospect must really believe that the red-hot flaming hoops you’re asking them to dive through are real. If they don’t, you’ve lost them forever. HYPE is a proof-killer. When everything seems too good to be true, the rationally sceptical prospect smells a rat. Paradoxically, if you’re prepared to admit a fault, this can have the effect of strengthening your core proposition. And by telling this story to his audience, Perry is obliquely communicating that this products ARE the right fit for them. See how that works? Metaphors or analogy are an effective technique for “dimensionalising” the benefits of a product or service. They allow the prospect to think about your product in a new way. Entrepreneurs tend to fall in love with their products and services and are keen to show them in their best light. But if you overstep the mark and make exaggerated claims, the rest of your pitch will lose credibility. As you proofread your copy, you should apply the “reasonable person” test to every sentence. Would the reasonable person find your claim credible in context? If not, wind down the hype-o-metre a touch. You want your copy to be brimming with enthusiasm, but never over-the-top. Dogs can hear frequencies humans can’t. Similarly, your target market may be attuned to the real or implied meaning behind the specific words and phrases you use. We see this in marketing for high-end matchmaking services. “We match bright, confident women with successful men” really means “we match hot women with rich guys”. Using the right jargon or keywords is also crucial to building credibility. Takeaway language is related to Reverse Proof. By not telegraphing a sense of neediness, and being willing to forgo business with prospects who may not be the right fit or with the right attitude, you paradoxically create a stronger sense of desire in your prospect. A sub-section of the Human Story, and probably the one most often seen in marketing, is the Origin Story. Your origin story builds a history and a pedigree for your offerings that often allows your prospect to understand your benefits or your company values at a deeper level. Origin Stories is a website featuring many examples of corporate origin stories, like the one below. These stories are typically woven into the fabric of an organisation’s marketing message and used to strengthen the core value proposition. Empathy is possibly the most useful emotional skill for marketers. If you’re able to understand your prospect so well that you can get inside their heads and hearts and connect with the emotion’s they’re feeling… and what they want to feel… then you create a bedrock of trust with your audience. If you found this article useful, please help to spread the word by sharing or linking to this page. I’d also love to hear your comments and suggestions for additional proof elements or examples that I may have missed.